Electrically conductive adhesives (ECAs) are mainly used in IC packaging, LED packaging and other electronic industry to replace the traditional soldering and lead-free solders, therefore, there is a constant need to improve the electrical conductive and mechanical property of ECAs. 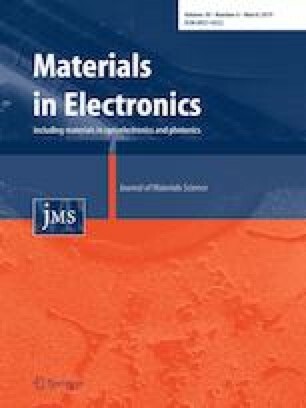 In this study, the electrical resistivity and shear strength of the modified nano-Ag coated Cu particles in ECA was investigated and compromised, in terms of filler contents, curing temperature and curing time. The conductive mechanism of the modified nano-Ag coated Cu particles in ECA was discussed as the filler content increased. Finally, the filler content was optimized by 23.5 vol% and 170 °C 100 min curing condition was selected to obtain the compromised property (5.159 × 10−6 Ω cm 6.121 MPa), which is better than the previous one (4.99 × 10−6 Ω cm, 4.406 MPa) at 200 °C. The tested data, as well as the failure mode and fracture interfaces, were carried out in this study. This research was supported by the Natural Science Foundation of China (Grant Number 51805115).